Whoof! It’s been a busy 24 hours in the whirligig life of this opera educator: last night, the first performance of A Midsummer Night’s Dream played at Bellevue’s Meydenbauer Center to a warmly receptive audience (including the opera club from Inglemoor High School, dressed to the nines). Then, this morning, Seneca Garber and I hosted our Teacher Training Workshop for The Marriage of Figaro, for teachers in our Experience Opera program. The teachers are now charged with taking the fruits of the morning, the zillions of ideas about Figaro and ways of introducing it to young people that were tossed around at that workshop, back to their schools and getting their classes ready to come experience the opera on the mainstage in a few weeks. After the workshop I dashed over to McCaw Hall for Das Rheingold at SIFF Cinema, a beautiful HD presentation with Dolby sound of a recent performance at the new opera house in Valencia, Spain. SIFF Cinema’s state-of-the-art equipment makes it a great place to watch both movies and these increasingly popular operas-on-a-movie-screen. The audience today (and for those who go to the second showing, tomorrow afternoon) enjoyed an exciting Das Rheingold conducted by Zubin Mehta and starring Stephen Milling, the mighty Danish bass who has often sung Fasolt in Das Rheingold at Seattle Opera (right, Milling as Hunding at Seattle Opera). 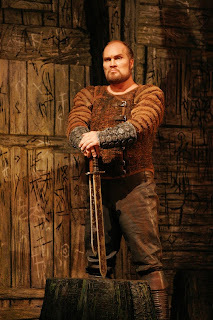 In the Valencia production, he sang Fafner and thus got to murder his brother Matti Salminen as Fasolt (for those of you who can tell Fasolt and Fafner apart!). The production is a blend of breath-taking projected visuals and acrobats doing amazing things as Alberich’s hoard and as Valhalla, and reminded me greatly of the theater of Robert Lepage, whose production of Bluebeard’s Castle/Erwartung just wowed Seattle Opera audiences. Its most stunning images echoed recent science fiction movies: the descent into Nibelheim was a nightmare perhaps inspired by The Matrix, and Erda’s apocalyptic vision of world-destruction transformed Planet Earth into the volcano planet from Revenge of the Sith. Would Richard Wagner have liked it? “Kinder, schafft neues!” he said: Make it new! And now (I’m posting this blog from backstage at the Theatre at Meydenbauer Center) for our second performance of A Midsummer Night’s Dream!